Reel Action Charters never compromises with its fleet of boats. They are the finest, most well-appointed fishing vessels to be found on the Great Lakes. We’ve built this fleet to ensure the complete safety, success, and enjoyment of our customers. Aboard any boat in the Reel Action fleet, you’ll never second-guess whether you’re fishing with the best. All our Lake Michigan boats are rigged with the latest safety and navigation systems and state-of-the-science fishing technology including the finest electronics available. Reel Action boats feature Simrad/Lowrance pro staff rigs including Simrad autopilots, chart plotters, broadband radar, and broadband sonar. Not only do these electronics put you on the fish, they keep you safe with complete weather analysis. Every Reel Action vessel is annually and rigorously inspected by the U.S. Coast Guard. 48-foot Viking – The Playtime – Overall Length: 48’7″ Beam: 16′ Draft: 4’7″ Displacement: 45,5000 lbs. Designed for deep-sea fishing on the brutally unpredictable North Atlantic Ocean, this boat delivers a level of comfort and luxury unmatched by any other charter service on Lake Michigan. It’s a roomy, stable platform for any group of anglers, even in rough seas. While the Playtime’s appointments certainly places it in the “yacht” category, it’s built and equipped as a fish catching machine. It’s the perfect choice for entertaining business clients, for multi-generational family gatherings, or for sharing with special friends on that once-in-a-summer salmon-fishing cruise. For a full group of six, the added cost is only $50 per angler to reserve this top-of-the-line fishing yacht. 41-foot Viking – The Unreel Action – Overall Length: 41′ Beam: 14’10″ Draft: 4’3″ Displacement: 32,000 lbs. Fresh off of a complete refitting, this big water battlewagon is the pride of Captain Scott Gutschow’s Reel Action fleet. The average charter boat on Lake Michigan weighs 10,000 to 15,000 pounds and is driven by gasoline engines. The Unreel Action weighs in at more than twice that at 38,000 pounds! For powering through the waves to reach the hottest fishing on the Sturgeon Bay Bank and beyond, she’s driven by turbocharged diesel engines. The ride is safe, reliable, and comfortable in any fishable conditions. SPECIAL OFFER: For the month of May, the Unreel Action will be based in Green Bay and specially rigged to offer the ultimate in comfortable, successful walleye fishing on Green Bay. Reel Action Charters is the only service to offer “Lake Erie-style” service on the Bay. You will fish in heated, fully-equipped comfort aboard this big water boat with modern bathroom facilities. When giant walleye fishing is at it’s best on Green Bay, the weather can be lousy, but aboard the Unreel Action, you’ll barely notice. Call Captain Scott Gutschow NOW at 920-360-2136 to book your May walleye run. Dates will book up fast! Fully rebuilt during the winter of 2013-14, Reel Action’s Grady-White is set up for speed, mobility, economy, comfort and – most importantly – catching fish. On saltwater, Grady White’s reputation for designing and building serious fish-catching machines is unsurpassed, and Reel Action brings that same performance to the waters surrounding Sturgeon Bay, Wisconsin. 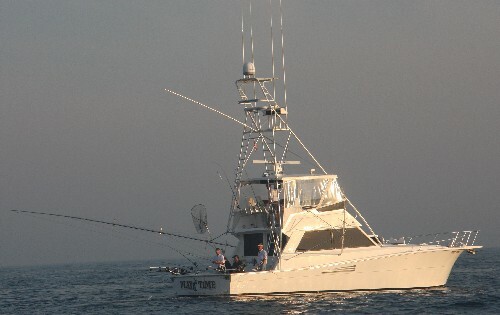 Grady-White boats are products of a unique combination of North Carolina’s saltwater heritage, a culture of long-term private ownership, a dedication to safety, and a keen knowledge of sportfishing. This boat is better rigged with the latest navigational and fish-catching technology than 90 percent of the Great Lakes charter boats twice its size. Reel Action’s Grady-White gets you to the fish so fast, they don’t know what hit them! For traditional Bay side fishing for walleye and smallmouth bass, Reel Action is proud to offer fishing aboard our 21-foot Lund Pro V Series tournament boat. As part of the Lund and Mercury Pro Staff, Reel Action provides the services of a brand new Bay rig every season! Full professional rigging includes is the latest fish-catching technology and equipment to help you catch monster walleyes, smallies, and even musky on the Bay. We’re rigged with two Lowrance HDS Color Graph/GPS units, air-ride pedestal seats, Motorguide/Panther Lift and Steer, and a 300 horsepower Mercury Verado, plus a Merc 9.9 4-stroke kicker. ABU Garcia and Fenwick tackle is proudly provided for every Bay fishing charter. New Addition to the Reel Action Fleet to be Announced Soon!